A beautiful beach city to let your love shine : Barcelona ! Imagine exchanging your wedding vows amid rambling streets, beautiful plazas and architecture that take your breath away…Wether you want to elope or renew your vows, Barcelona is the perfect setting if you want your love to shine under the sun! Barcelona is a city made for passion. Stroll down Las Ramblas and the food markets for an experience of all the senses, soak up Gaudi’s works of art in the fantasy-like Parc Guell, or stroll along the beach for a lazy walk. Barcelona is a lively city, full of life, food and sun, one of the few cities in the world that can boast both a stunning city architecture and great beaches. It is THE place life lovers enjoy, and you can feel it in the air. 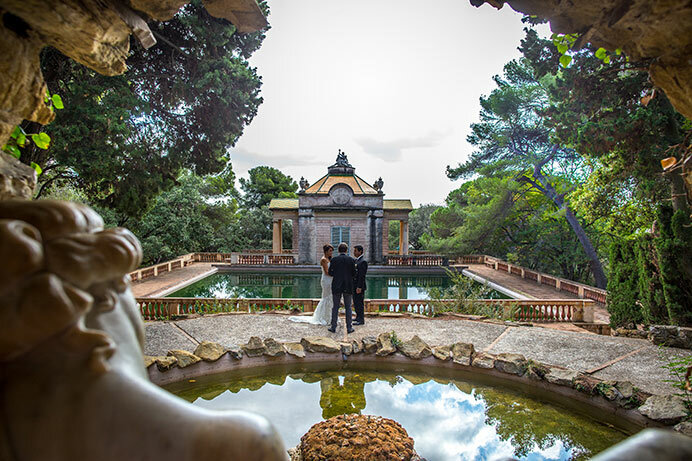 Amongst all the exquisite spots that Barcelona offers, our officiant will help you find the perfect location for your marriage vows. As one of our top ten wedding destinations, you can be certain that your wedding vows ceremony in Barcelona will be a time to remember. Several world heritage sites are scattered around the city and create a most romantic environment to enhance your wedding ceremony. Saying “I love you” in Spain is an opportunity for you to show just how much you do. Although most couples would choose Park Güell or Montjuic for their elopement or vow renewal ceremony, Barcelona is a big city with hundreds of possibilities, from breathtaking views to secret streets or magical fountains. Park Güell is of course perfect for couples wishing to elope or renew their vows in the maximum intimacy while surrounded by the beautiful Gaudí architecture and gardens. On the contrary, if you prefer city views, an impressive palace or dramatic fountains, without any doubt, Montjuic hill will be your place. One of our favorite place though is a lesser touristic park called “the Maze”. What else for an “amazing” celebration ? The park is Barcelona’s oldest. Built in the 18the century, it is divided up into the maze itself, and a little park called the romantic park. We have had amazing elopement and vow renewals celebrated here. And we know you will love it too. Wherever you decide though, at Love Gracefully we’ll make sure everything is ready to make your day the most special and romantic ever. Since we are based in Barcelona, and our partners were born and live there, we know exactly where to go to find what you are looking for… From the most intimate locations to the most talented vendors in the city. We have worked with seasoned wedding photographers, florists, musicians, hair and make-up artists. And we’ll be happy to introduce them to you. Having celebrated over 350 elopements, vow renewals and destination weddings in France and Barcelona, we have gathered and unparalleled expertise. But what people like the most about us is the way we took care, in a very personal way, of their ceremony. What makes us unique is that, unlike our competitors, we don’t work from template ceremony texts; we create each time a new elopement or vow renewal ceremony that fits exactly who you are. Our celebrants are all multilingual and professionals; no students or part-time comedians work for us. So, wherever and whenever you’d like to celebrate your intimate ceremony, at Love Gracefully we’ll make everything possible to please you and your fiancé and turn your wedding into the happiest day of your lives. Feel free to contact us at any time!